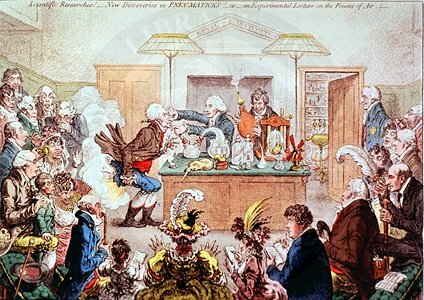 A caricature by British satirist and cartoonist James Gillray (1757-1815) of experiments with nitrous oxide (laughing gas) at the Royal Institution. Thomas Garret, Davy's predecessor as professor of chemistry, is the lecturer; the founder of the Royal Institution, Benjamin Thompson, Count Rumford, is standing at the doorway; and Humphry Davy is working the bellows. An agent that inspired such frivolity and merriment was not an obvious source for a surgical revolution.